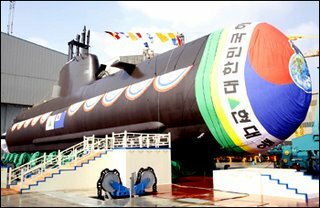 The South Korean Navy Friday launched its first, 1,800-ton class, state-of-the-art submarine equipped with advanced missile systems, a Navy spokesman said. The 214-Type submarine, 65.3 meters long and 6.3 meters wide, is equipped with Air Independent Propulsion (AIP) that helps improve its underwater capability. It can submerge to a depth of up to 400 meters and carry out underwater operations for a maximum two weeks at a time. The submarine, equipped with eight torpedo tubes and advanced submarine-to-surface missiles, has a maximum dive speed of 20 knots and a seating capacity of 40. It costs around $1 billion. The Sohn Won-il submarine will be declared operational in the second half of next year after undergoing sea trials, according to the Navy.